With this activity we are teaching the scientific process and encouraging kids to use inquiry based activities to prove theories. 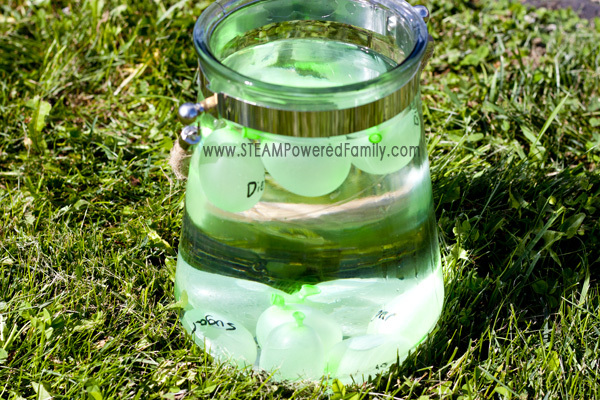 Yesterday I posted about an experiment we did testing liquid density with water balloons. This activity was a huge hit and shortly after doing it we came up with the idea to test some science we had researched in the past. This lead to some interesting discussions around the scientific theory and how we can question and test theories ourselves. 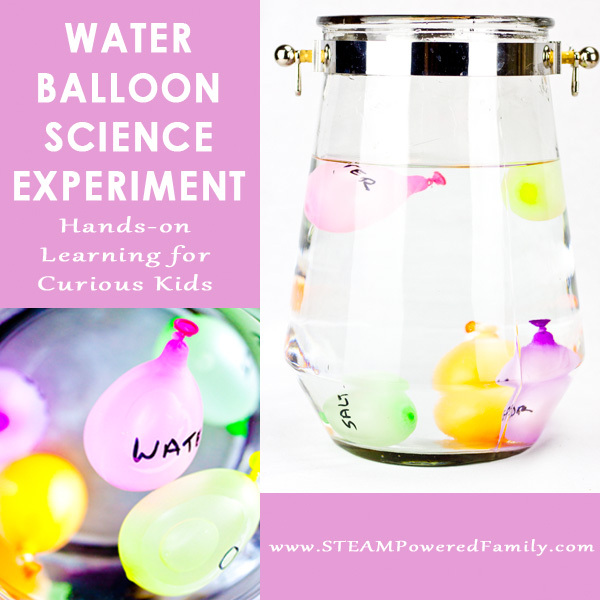 This project turned into a wonderful chance for teaching the Scientific Process. 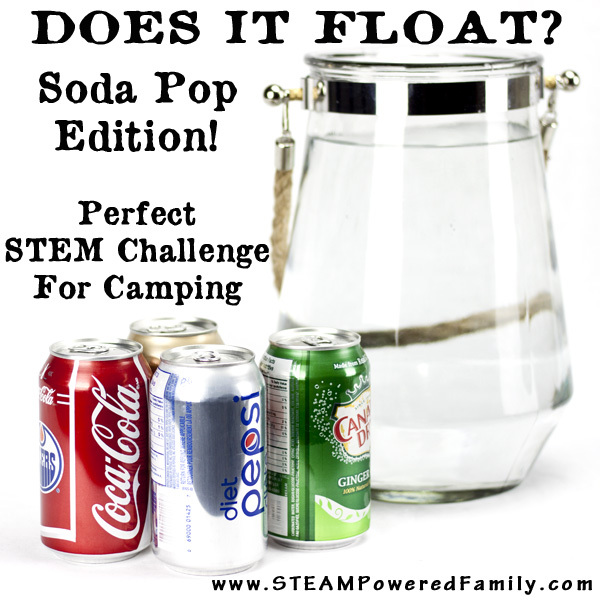 You may remember an activity we did this past summer where we tested whether cans of soda pop float or sink. The results were amazing! Diet pop floated, while regular pop sank. When we researched the science we discovered it was because the sugar was heavier and created a higher liquid density, than diet sweeteners. At the time my kids walked away happy. Then we did a water balloon liquid density experiment and it started my oldest questioning. How did we know for sure the science we read about was right? Great question! So we set up our own experiment to test the scientific theory and in the process teaching the scientific process. With what we learned from those activities we developed our theories and hypothesis. We didn’t have any reason not to believe the scientists who told why why the pop cans floated or sank, but we still wanted to prove it for ourselves. So using concepts from the two activities we developed our own experiment. 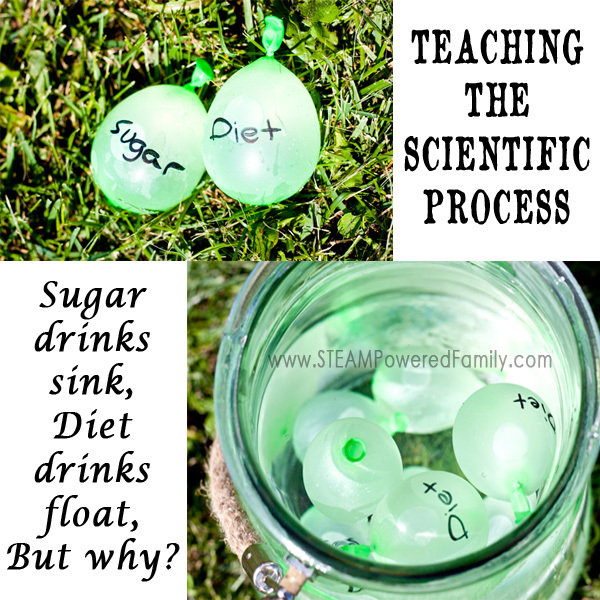 This allowed us to come up with a way to prove the theory of why diet pop floats and regular sinks. 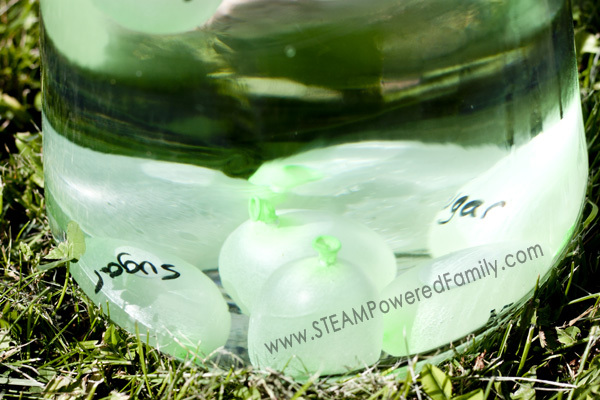 Our experiment was quite simple, using the strategies we used in the water balloon science experiment we prepared two types of water balloons, a sugar balloon and an artificial sweetener balloon (we used Splenda). To fill the balloons we used a 60 mL catheter syringe and it worked beautifully! One syringe full made a nice egg sized water balloon. One variable we needed to consider was the saturation of our liquids. So we made a few different sugar and diet solutions, varying the dilution (the amount of product added to the water). 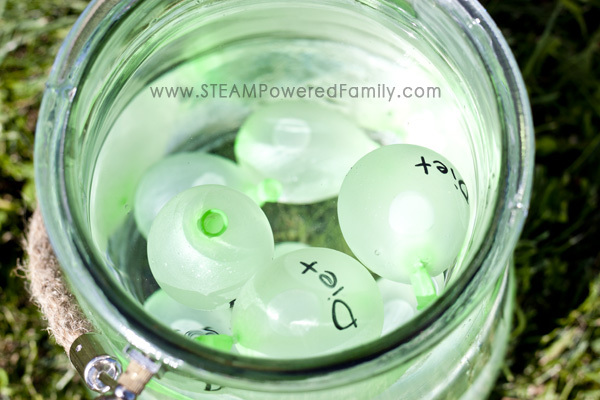 After filling our balloons and labeling them, we prepared to place them in our testing chamber (fancy science speak for my hurricane jar!). First the sugar balloons. And they sank. 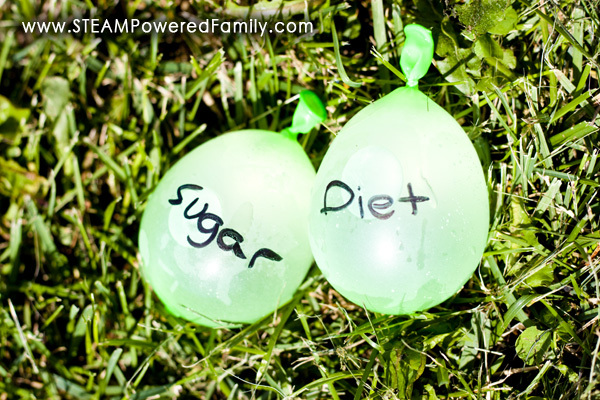 Then the diet balloons. And they floated! And the scientists were right! The sugar ones sank and the diet ones floated! Now we had no reason to think this theory was wrong, but this was a fantastic approach to teaching the scientific process and exploring how we can prove theories ourselves. Plus, I want to raise kids that are critical thinkers. Able to gather information and verify the voracity of details, so they can come to educated conclusions. There is so much information available, knowing how to prove what is right will be very important in their lives. Today’s activity was a fantastic step in the right direction. Oh, and it was tons of fun having a water fight with the balloons after, even if we did get a little extra sticky from the sugar! GREAT science experiment. Now, how can the children test what the difference is when these liquids enter out bodies? Don’t know how it could be tested, but it would be an interesting experiment.